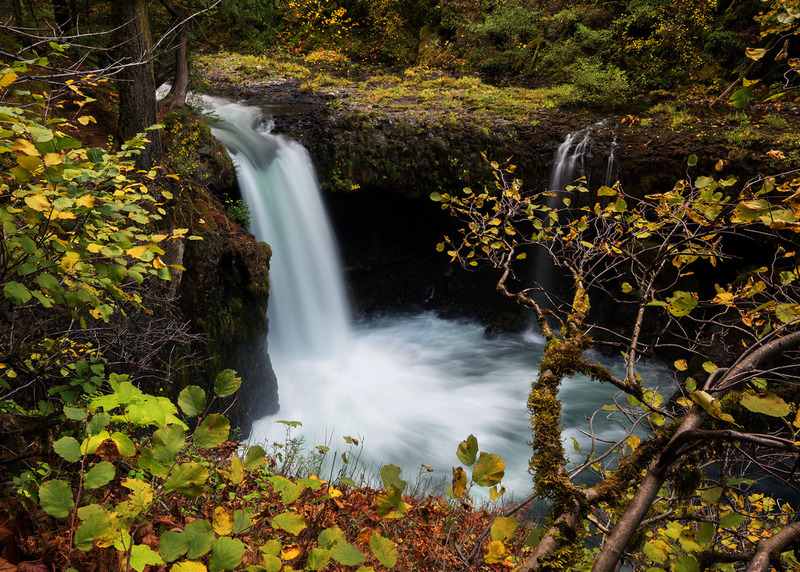 The most amazing waterfall photos on Flickr and 500px always seem to be from one of two places: Iceland or the Columbia River Gorge. I’d already been all the way to Iceland, but for some reason I’d never explored the relatively nearby Columbia River Gorge, despite the fact that I’d driven right past it multiple times. I looked forward to correcting that oversight. The biggest challenge in planning my trip was choosing which waterfalls to target. There are so many I felt overwhelmed. 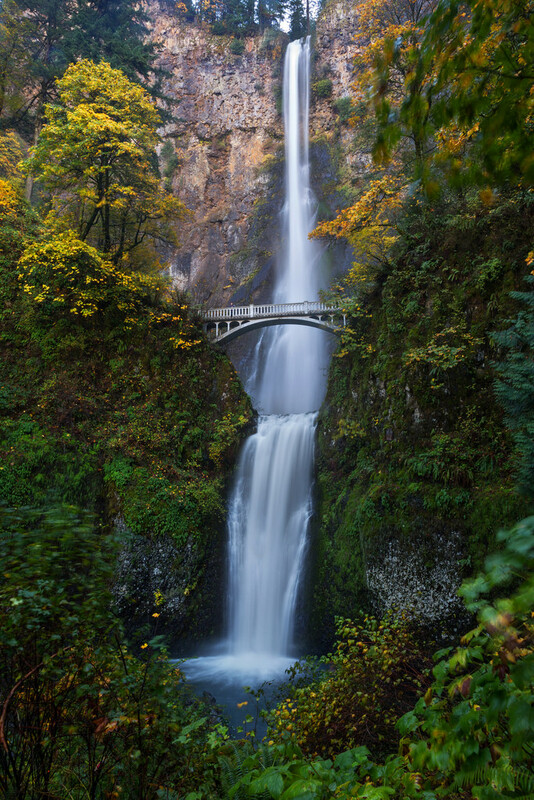 I definitely wanted to check out the big waterfalls along historic Highway 30, including the extremely popular Multnomah Falls. But I didn’t want to miss some of the more off-the-beaten-path waterfalls that aren’t as easy to reach, like Spirit Falls, Lower Oneonta Falls, and Mossy Grotto Falls. I’d need to spend at least a few days in the area. My timing wasn’t ideal. 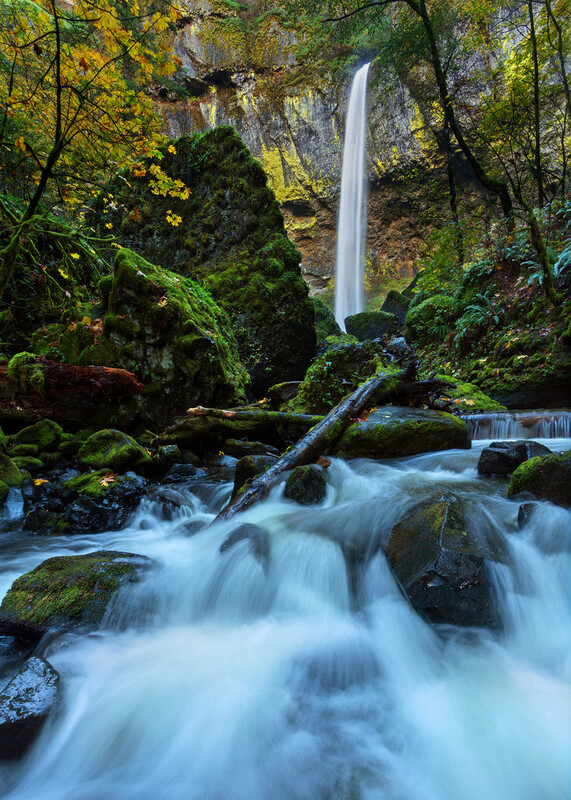 The waterfalls of the Columbia River Gorge are particularly photogenic in the spring, when the water levels are higher and the green of the surrounding vegetation is peaking. 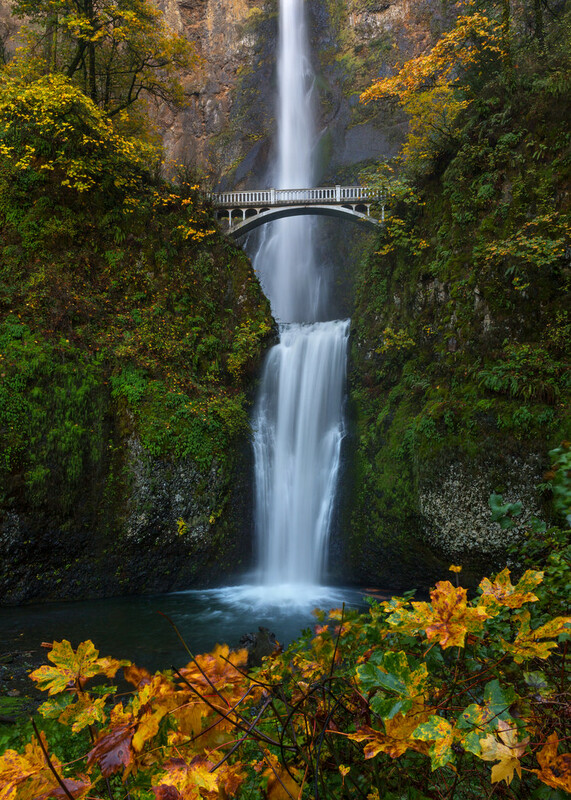 But the fall colors have their own appeal, even in the Pacific Northwest. And it was the perfect time of year for a quick stop I planned to make at the Japanese Gardens in Portland’s Washington Park. One of the highlights of the Gardens is an incredible Japanese maple tree with leaves that can turn bright red in the fall. I arrived at Washington Park at about 9am. The slight mist hanging in the air was perfect for the kind of photos I envisioned, and I couldn’t wait to get to the maple tree. Then a sudden gut-punch: signs announced that the Japanese Gardens were closed until March for construction. Apparently my pre-trip research missed some important details. I circled the Gardens, both in the car and on foot, searching for a way to slip in, but large fences with “No Trespassing” warnings blocked all entry, and the whole area was bustling with construction workers. I had to accept that I was simply out of luck. My disappointment faded away pretty quickly as I left Portland behind and made the turn onto the Historic Columbia River Highway. 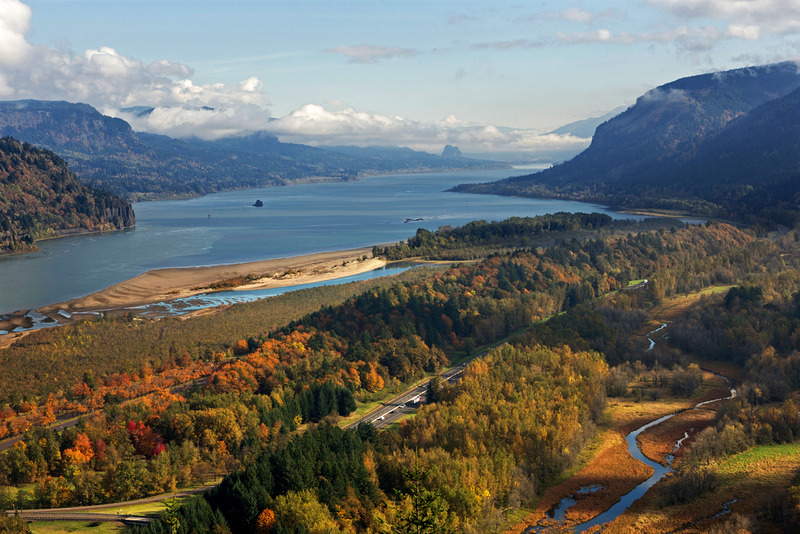 The scenic road, originally built about 100 years ago, rose sharply to a great view of the Columbia River from the Crown Point Overlook. A few more miles took me to Latourell Falls, the first of the major waterfalls along the highway. 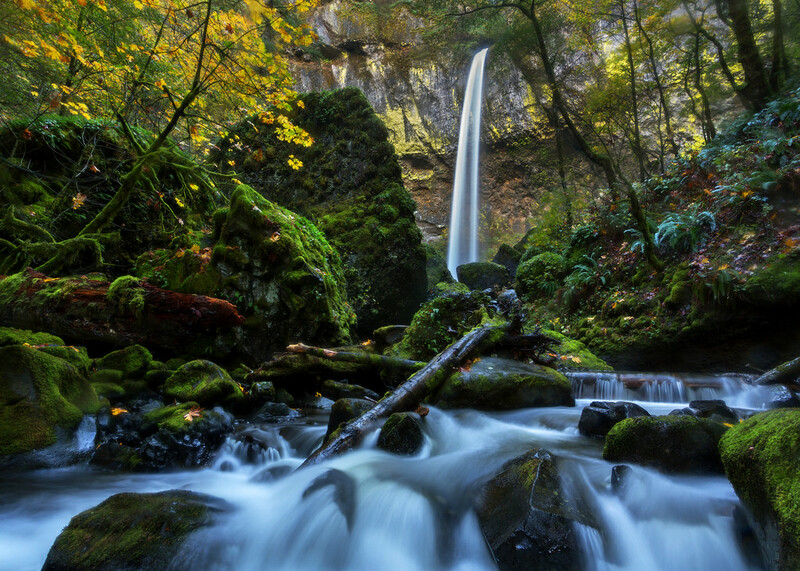 I made a quick stop there and at Wahkeena Falls before arriving at the two-tiered Multnomah Falls, Oregon’s tallest waterfall. It’s truly beautiful, despite the crowds. I spent some time at the main viewing area at the base of the falls and then walked up to the small bridge at the top of the lower tier. From Multnomah I drove on to Elowah Falls, a short one-mile hike from the parking area. It was impossible to approach the base of the falls without getting soaked in the spray, so I worked my way down to the creek bed for a few shots. Even there it was tough to keep my camera lens dry. After Elowah I had enough light for one more waterfall that day, and Spirit Falls – over the river on the Washington side – wasn’t too far away. So I crossed the Bridge of the Gods (which had a cameo in the recent movie Wild) and drove east along the Lewis and Clark Highway. I turned up Cook-Underwood Road and stopped at an unmarked pulloff where – according to my online research – I would find a faint, unmaintained trail leading down a steep slope. I wasn’t entirely certain I was in the right place. Spirit Falls is apparently a popular spot for kayakers, and there should have been enough foot traffic to leave a visible path. “No Trespassing” signs were planted on the northern side of the pulloff, so I decided to follow what looked like a possible trail on the southern side. I hadn’t gone far when the hint of a trail took me out on a narrow ridgeline with sharp drops on both sides. The online directions said to expect steep inclines, but this was a little ridiculous. I made my way forward carefully, often crouching down to grab handholds in case my feet slipped. A slight movement caught my attention, and I realized a small deer was lying on the ridgeline just ahead. The deer noticed me at the same time and bounded off with the sure-footedness of a mountain goat. Was this only an animal path and not a trail? Just when I thought I couldn’t continue any farther it became possible to cut left and drop down towards the Little White Salmon River. It was still so steep I often slid, but by going slowly and using the rocks and trees as handholds I made it without tumbling. 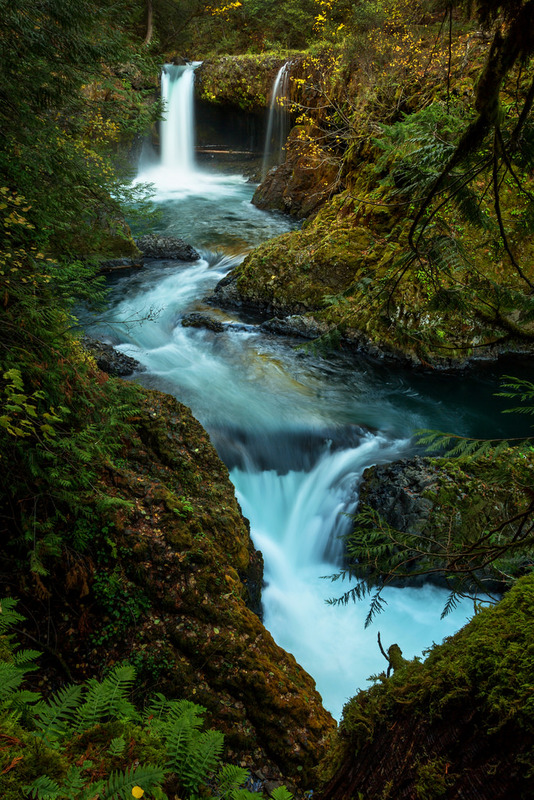 The river finally appeared, and by following it north a short distance I found Spirit Falls. I almost didn’t recognize it. Most of the photos I’d seen were taken in the spring, and now the water levels were so low that it wasn’t nearly as wide. Bolted into the rocks right next to Spirit Falls was a blue sign that said “Live Like Logan.” Later I learned that it’s a tribute to Logan Jauernigg, a 20-year old from Colorado who was killed in a kayaking accident near the falls back in May. It’s admirable to honor the memory of a lost friend, but I wonder if Logan would have been a fan of hanging bright plastic signs in otherwise natural environments. From the falls I found a different trail back up to the road. While still steep, it wasn’t nearly as difficult as the one I’d taken down. It led right to one of the “No Tresspassing” signs on the northern end of the pullout. Ha! Of course.